For most of us, our satellite-tracking interests extend to only a small handful of satellites. Whether it be the amateur radio or weather satellites, TVRO, or even the combined GPS/Glonass constellation, we're typically talking about tens of satellites. Even if we consider all of the operational satellites on orbit, we're still only talking about hundreds of satellites. But there are those among us whose duty it is to track the now 8,500 satellites in earth orbit—payloads, spent boosters, and other debris—on a daily basis. These are the men and women of the Space Control Center (SCC), buried deep within Cheyenne Mountain. 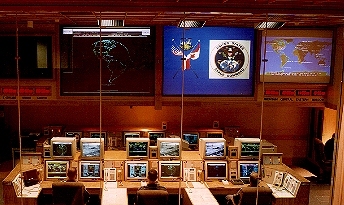 Part of the Cheyenne Mountain Operations Complex or CMOC, the SCC is responsible for detection, identification, and daily tracking of all man-made objects in space. Run by US Space Command for the North American Aerospace Defense Command (NORAD), it is manned primarily by personnel from the Air Force, Naval, and Army Space Commands and the Canadian Air Force. Their basic mission is to protect the North American continent and US and Canadian interests worldwide against threats from space. These threats come from a variety of sources. They can arise from dangers such as overhead surveillance of military forces during conflict. Or, they can also result from accidental events, such as the reentry of a space object—which might threaten a population center or trigger a false missile-attack warning—or the collision of a dead satellite or a piece of debris with an operational satellite such as the US space shuttle. The only real way to guard against these threats is to detect any and all space objects, identify what they are (and what their missions are), and know where they are (or will be) at all times. To accomplish its mission, the SCC relies on the Space Surveillance Network or SSN as its eyes and ears. The SSN is a network of sensors located at two dozen sites worldwide and operated by US Army, Navy, and Air Force personnel. The SSN uses three primary types of sensors to monitor the earth's population of artificial satellites: conventional radars, phased-array radars, and an optical system known as the Ground-Based Electro-Optical Deep Space Surveillance system or GEODSS. The SSN's conventional radars consist of both tracking and immobile antennas. Typically, these antennas operate in bistatic mode—that is, one antenna transmits a pulse and another receives the return. One of the more interesting 'conventional' radars in the SSN is the NAVSPASUR system—a network of three transmitting and six receiving radar sites spanning the continental US from San Diego, California to Tattnall, Georgia. Laid out as a fence of electromagnetic energy along the 32nd-33rd parallel through which all satellites with orbital inclinations greater than 33° must pass twice a day (over 80 percent of the current population), it can detect objects crossing it out to a distance of more than 25,000 kilometers. The SSN phased-array radars can track a dozen or more satellites simultaneously and scan large volumes of space because they have no moving mechanical parts. Instead, these radars are composed of thousands of small elements which can be phased to electronically steer the antenna. Of the SSN's phased-array radars, the AN/FPS-85 at Eglin AFB in Florida is the workhorse of the network. It is made up of almost 6,000 transmitter antennas and 20,000 receiver antennas and can track objects from just above the horizon to just short of the zenith over an azimuth of 120 degrees. Capable of generating 30 megawatts of radio frequency power, it can track space objects in excess of 40,000 kilometers in range. 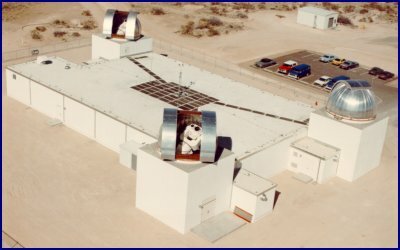 Each GEODSS site combines three telescopes—two primary 40-inch telescopes and one 15-inch auxiliary—to image objects in space 10,000 times dimmer than can be seen with the unaided human eye. Rather than using photographs, as the earlier Baker-Nunn cameras did, it uses charge-coupled devices (CCDs) to electronically image each satellite track. Computer processing then removes the stars and other background light sources to produce the observations. As with any optical system, GEODSS can only be operated at night and in clear weather. This network of dedicated and collateral sensors generates up to 80,000 satellite observations each day and sends them back to the SCC via redundant communications systems. While this may seem to be a lot of observations, it still does not permit continual tracking of everything in earth orbit—primarily because of the limitations arising from the geographical distribution of the ground-based sensors. As a result, the SSN uses a predictive technique to monitor the catalog of space objects—periodically making sure each object is where it is predicted to be and generating new element sets when they aren't. In order to be able to keep track of everything once it's detected, the 1st Command and Control Squadron (1st CACS) maintains a catalog of all space objects orbiting the earth (and some beyond) which are ten centimeters (about the size of a baseball) or larger in size. Over the years, they have catalogued almost 25,000 objects. Of the 8,500 objects being tracked today, only about 7 percent are operational satellites, 15 percent are rocket bodies, and the remaining 78 percent are either inactive satellites or assorted other space debris. Subtracting out the number of active satellites from the total population, it quickly becomes apparent that there are almost 8,000 uncontrolled objects of various sizes and shapes tumbling through space at velocities ranging from 3 to 10 kilometers/second. Being hit by one of these could ruin your whole day. Keeping track of potential collisions—especially with manned spacecraft such as the US space shuttle or Mir space station—is an important part of the SCC mission. According to US Space Command, most debris—about 84 percent—orbits above 800 kilometers—an altitude more than twice that of either the US space shuttle or Mir space station. They assess the likelihood of a significant collision with one of these manned spacecraft as extremely remote—about one chance in 10,000 years. Space is—after all—a pretty big place. Unfortunately, the likelihood of a collision with something smaller than ten centimeters in size is higher and unknown since the SSN cannot currently track these objects. Each item in the Satellite Catalog (SATCAT) is identified by two unique identifiers. The first is the International Designation. Prior to 1963, the International Designation was made up of two parts: (1) the launch of the year (the year itself being implicit) and (2) the piece of the launch. The launches of each year were designated (in order) by the letters of the Greek alphabet and the pieces of each launch were numbered. This system was more than adequate in the 1950s since there were only a handful of launches each year. In 1961, however, the number of launches exceeded the number of letters in the Greek alphabet, so, launches after the 24th launch of 1961 were preceded with the letter Alpha (which is abbreviated to A in the database, e.g., A ALPHA, A BETA). With even more launches in 1962, launches after the 48th were preceded with the letter Beta (e.g., B ALPHA, B BETA). It was quickly becoming apparent that a new system was required. In 1963, the International Designation was changed to consist of three parts: (1) the year of the launch, (2) the launch of that year (000 through 999), and (3) the piece of that launch (A through ZZZ). For example, the Mir space station has the International Designation 1986-017A, that is, it was piece 'A' of the 17th launch of 1986. The second unique identifier is the NORAD Catalog Number. It is simply a number indicating the sequence in which space objects have been added to the SATCAT. The NORAD Catalog Number and International Designation do not always track together since it is possible to detect a piece of a launch well after the first piece of that launch was detected. The Mir space station—International Designation 1986-017A—is NORAD Catalog Number 16609. However, the last garbage dump from Mir (yes, even these are catalogued) was International Designation 1986-017MA, NORAD Catalog Number 24673. The International Designation system considers any subsequent debris—no matter how many years later—to be part of the original launch. Identifying satellites by name can be problematic. Because many satellites have multiple payloads onboard, it is common for the same platform to be referred to by different names. Several amateur radio satellites fall in this category because they are piggybacked on another payload, being referred to by the name of the amateur radio payload by the its user community and the name of the main payload by its user community. Other satellites simply have multiple names, as with the Cosmos series of satellites. It is always best to use one of the unique identifiers above when referring to a specific satellite to ensure there is no ambiguity. Having access to the current SATCAT can be a useful tool for those involved with satellite tracking. Whether it is used to find something specific such as the NORAD Catalog Number for a satellite in order to obtain the proper element set or just to perform some statistical analyses (e.g., number of payloads on orbit, percent of the catalog launched by the US), the results can be both helpful and enlightening. If I had more space, I could regale you with various space trivia showing trends within the SATCAT. Perhaps I'll save that for another day. Instead, I am working on providing an online version of the SATCAT on the Celestial WWW site. Based largely on NASA's Satellite Situation Report combined with information from Jonathan's Space Report and the monthly NSSDC's SPACEWARN Bulletin, it will provide a fully-searchable online catalog with weekly updates. It should be available online by the time this issue reaches you. The goal is to provide a current catalog along with various statistics and charts to make it easier for you to answer your questions about the population of earth-orbiting satellites. I hope you'll find it useful. As always, if you have any questions or comments regarding this column, please feel free to contact me at TS.Kelso@celestrak.com. Until next time, keep looking up!